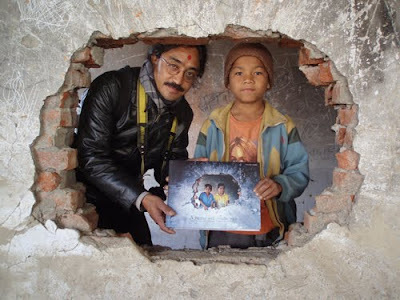 Photographer Amrit Gurung presents a copy of the book A People War featuring many of the “peace” photographs in Kunda Dixit’s photojournalism exhibition of the decade-long civil war in Nepal to Hemanta who was portrayed in the same spot on the cover. KEY Asia-Pacific, Australian and New Zealand investigative journalists and researchers will gather at AUT University next month for a media “conversation” that will feature diverse issues such as war reporting, scams and global warming probes. They will also consider the future of independent journalism and map out a strategy for more robust inquiry. The two-day conference at AUT University on 4/5 December 2010, organised by the Pacific Media Centre, will host an investigative “masterclass” for young journalists, New Zealand’s first seminar on peace journalism, and screen groundbreaking documentaries or multimedia presentations on mining and Kanak independence in New Caledonia, Māori land rights in the Far North, and climate change. Five leading Pacific Islands investigative journalists are also participating in the conference. “This is a niche conference and one that features a range of innovative speakers and challenging investigation case studies,” says conference chair Associate Professor David Robie, director of the PMC. Television New Zealand Pacific correspondent Barbara Dreaver is the latest keynote speaker to join the Media, Investigative Journalism and Technology conference. She has broken many stories around the region and investigated many key issues. She joins Kunda Dixit, editor of the Nepali Times and an Asia-Pacific investigative journalist; New Zealand investigative journalist Nicky Hager; and Professor Wendy Bacon, director of the Australian Centre for Independent Journalism and who runs a global environmental investigative journalism programme. Other Pacific participants include Koroi Hawkins, chief of staff of Television One Solomon Islands; Patrick Matbob of Divine Word University in Madang, Papua New Guinea; Kalafi Moala, publisher of the Taimi Media Network (Tonga); and Shailendra Singh, of the University of the South Pacific. The PMC is also hosting a masterclass in investigative journalism for student journalists and younger journalists facilitated by a team of international investigative journalists, including Dixit, Bacon and Dr Kayt Davies; and a specialist peace journalism seminar, organised by Dr Heather Devere of the National Centre for Peace and Conflict Studies and Rukhsana Aslam, a peace journalism educator from Pakistan. Freelance war correspondent Jon Stephenson and strategic analyst Dr Paul Buchanan will give insightful papers on New Zealand and the so-called war on terror and embedded journalism. Exhibitions of photojournalism by a collective facilitated by Kunda Dixit covering the decade-long Maoist civil war in Nepal - "Frames of War" - and Ngapuhi social issues photographer John Miller (featuring the little-known Ngatihine land rights struggle) plus workshops about challenging documentaries by Jim Marbrook and Selwyn Manning are part of the programme. A seminar about the making of the award-winning film about global warming There Once was an Island: Te Henua e Noho is also featured. Don't miss this rare opportunity. Registration for the conference is now open. David, this is a distinguished line-up except for one person - Barbara Dreaver. Her coverage of Pacific affairs has been abysmal. In spite of coming from the region herself, she displays all the cultural sensitivity of a big city tabloid reporter. Never mind her sensationalist beat-ups in places like Samoa, Dreaver has utterly failed to grasp the fundamental issues in Fiji. Lionising her for the quality of her "investigations" verges on the insulting. I wonder what the estimable Shailendra Singh thinks about having her on the same platform. Not much, I'll bet. People like Dreaver and John Campbell are the reason NZ reporters are on the nose in the islands. But I guess they merely reflect the lamentable sense of superiority of most New Zealanders. The disgraceful Paul Henry episode would never have dragged on for so long anywhere else. Ha ha this guy sounds like the idiot academic at USP, Desmond Amosa, who wrote the classic piece "the evil side of journalism" ... all sour and no grape. "You wouldn't write all that crap if you knew what was really going on!" Well, ah ... duh ? For all his Big Man Talk about Fiji, the Samoa PM remains a regional shrimp who, again and again, proves he can't handle the jandal, let alone answer hard questions. I guess because someone has to dig up the facts, and gut-poor, anonymous, commentators seem loath to do the job themselves.